When you score Hostile Takeover, gain 7credit and take 1 bad publicity. There are going to be some changes around here. 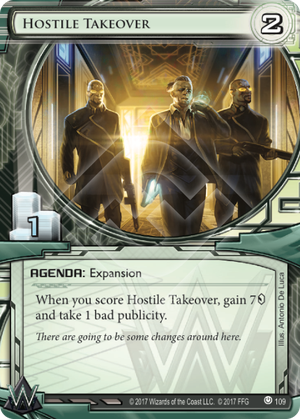 For most of the history of the game, Hostile Takeover is an essential agenda for Weyland. A huge credit boost, that can be scored with no protection. It is then a cheap and available agenda to rez Archer. That is why it has been such an integral part of Weyland decks for so long - Archer is simply a very good piece of ICE. Cheap (ish) to rez, very taxing to break, and if its subroutines land it can really set a runner back. The need for cheap agenda’s to sacrifice to it is very important, and anything bigger than Hostile Takeover is generally not going to be worth the gain rezzing an Archer is going to bring. Hostile is also great for that seventh point, after six points have been scored Hostile can close out the game quick and easy like, and that is a very good point in its favor. The problem comes with the Bad Pub. Bad Pub is something that has also been Weyland’s thing - We’re gonna make money and we don’t care what you think about it style of playing.That Bad Pub however means that making taxing servers (such as using Archer) are not nearly as taxing, leading to problems keeping the runner out. That makes Hostile at the same time a synergy for Archer and an anti synergy, which puts Weyland in a difficult place. Hostile will continue to be used for a long time. It is a five credit gain and an agenda point, and it is well worth it to turn on Archer most of the time. Perhaps it will fall out if another 1 point or even a 0 point agenda for Weyland is printed, but until then it is unlikely to stop being used, even at the drawback.